The 71 years of our existence has witnessed many upheavals — the turbulent journey which started on August 14, 1947 continues with intensified pains and pangs after the 2018 elections were alleged to be rigged by all major opposition parties. The early 10 years of our existence marred with ‘crisis to crisis’ paved way for the first martial law imposed on October 7, 1958 and followed by three, in 1969, 1977 and 1999. Earlier two culminated in the dismemberment of the country in 1971. However, no lessons were learnt and even after the adoption of the Constitution in 1973, extra-constitutional acts continued. The sordid story of Jul 5, 1977 and October 12, 1999 is known to all. In between, the civil rules were overshadowed by “control” from outside and “incompetence” from inside — resultantly we failed to establish people’s rule and participative democracy. The failures on political, economic and social fronts during the decade of democracy (2008-2018) again confirmed a lack of determination on the part of politicians to act collectively and resolutely to end interventions by players of the ‘garrison state’. Many significant achievements during the last 71 years have been nullified due to the deprivation of masses at large and lack of justice for the less-privileged. The damage done to national cohesion by authoritarian rules and denial of fundamental rights of people by elites are well-documented by many, especially by Mazhar Ali Khan in Pakistan: The first Twelve Years and Pakistan: The Barren Years. Alongside Dr Ishtiaq Ahmed who explores the notion of the garrison state in great detail in his book Pakistan: The Garrison State: Origins, Evolution, Consequences 1947-2011. Despite all odds — indifference and apathy of political leadership, learned helplessness of the masses and long military rules — the nation has showed resilience and unshakable faith in the electoral process whenever they get a chance. They did it on July 25, 2018 as well. It is now for the political parties to act responsibility for consolidating democracy and countering anti-democratic forces. It is high time that legislators send a clear message to courts that their mandate under the Constitution is to apply and interpret the laws and not to indulge in real politik. Enforcing the will of the people is essentially a political question that cannot be resolved in the courts. Since our leadership has failed in the past on this account, the entire society faced devastating effects of unrepresentive rules. The establishment of a bona fide people’s rule remains a challenge for political forces. The reason for this failure since 1947 is the subject matter of voluminous scholarly work that seeks to explain the interplay of two interwoven and interlinked factors behind the turbulent State and perpetuation of non-democratic interferences even after uninterrupted civilian rule since 2008 — religion and militarism. The political abuse of ‘religion’ by Ziaul Haq’s and consolidation of the ‘garrison state’ is elaborated in detail by Dr Ishtiaq Ahmed. Dr Ishtiaq explains how Pakistan emerged as a ‘garrison state’ during the Cold War and thereafter dominance of the armed forces over all other institutions became visible. The rise of military to this level has both internal and external factors. Historically speaking, its roots go back to the military interests of the United States in this region after the fall of the British Empire. The branding and marketing of Pakistan as a ‘frontline state’ has been documented by the author creating a furore in some circles refusing to accept the truth. The history of the garrison state, as narrated by Dr Ishtiaq, explores many myths, depicts the true events and exposes many faces that ultimately rendered the ‘fortress of Islam’ into a ‘CIA Headquarter’ during the so-called Afghan Jihad, making it a “breeding ground of terrorism.” The once allies and holy warriors, are now dangerously poised against the United States and her allies, neighbours and democratic societies, which are under threat from fanatics who ruthlessly resort to deadly terrorist attacks. 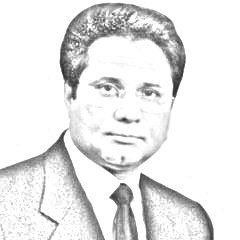 Dr Ishtiaq has meticulously traced the journey of the garrison state that started from falling in the laps of the US, to armed conflicts with India, from martial laws to the birth of Bangladesh, from follies of political leaders to the brutal Islamisation of Zia and from corruption of elected governments to the proliferation of terrorism. This, he rightly adjudges is the path of self-deception and self-annihilation. He justifiably deplores the attitude of conspiracy-mongers that shift blame on outsiders rather than admitting their own faults and mistakes. It is an incontrovertible fact that in Pakistan, either directly or indirectly, political power has always been with the army. Unlike many other writers, Dr. Ishtiaq has not entered into this blame game — fixing this responsibility of the debacle on a particular institution or a political party or a class. However, in the final analysis, facts show that it is a collective failure in which, no doubt, the ruling classes committed blunder after blunder. They are mainly responsible for the present pathetic state of affairs more than anybody else. To overcome this dilemma, the author in the end has reached the conclusion: “It is, therefore, imperative that the stakeholders in the Pakistani power equation — especially the military — work out a long-term policy and strategy that can create stability, peace and prosperity within Pakistan as well as help normalise relations with its neighbours — provided they, too, nurture similar aspirations” No one would disagree with Dr. Ishtiaq whose work holds a hope for Pakistan, provided the forces that matter come out of their self-assumed notions like “custodians of ideological fronts” and facilitate the newly-elected Premier Imran Khan in achieving the resolutions he made in his speech of July 26, 2018. It is high time that all stakeholders initiate a meaningful dialogue for converting the garrison state into an egalitarian state. The tragedy of garrison state is that its de facto rulers and cronies working for them do not care about the aspirations of the people and have done nothing worthwhile for the less-privileged. This lamentable attitude of the beneficiaries of the garrison state is a suicidal path. It is hoped that the new coalition government will steer clear of this and learn the necessary lessons from history.